Today, 33 1/3 Brazil author Bryan McCann explores how bossa nova links to two other important cultural developments in mid-’50s Brazil: air travel and the construction of the “airplane city”, Brasília. Bossa nova came from Rio de Janeiro—directly from its beaches, nightclubs and middle-class apartment buildings and indirectly from its downtown streets and hillside favelas. But because it emerged when it did—in the late 1950s—it is inextricably linked to two phenomena that pull it away from the specificity of Rio de Janeiro in different directions: the construction of Brasília and the expansion of jet travel in Latin America. There is a triangulation of bossa, Brasília and the airplane that captures much of mid-century Brazil—and illuminates and cosmopolitan sound of the music. “Samba do Avião” lovingly describes the specific cultural geography of Rio—brown women dancing the samba, the statue of Christ the Redeemer with his arms open above Guanabara Bay. But the perspective is from inside the enclosed cabin of the aircraft—“the water sparkles, look at the runway drawing close, and we are going to land.” Jobim’s warm popular touch notwithstanding, this is the perspective of the jet set. It is no accident that Tony Bennett included the song, with translated English lyrics, on his 1965 album If I Ruled the World: Songs for the Jet Set. Although the song is about landing in Rio, the image of the airplane also evokes the planned city of Brasília, famously laid out by planner Lúcio Costa in the shape of a jet plane. Brasília does not have neighborhoods. It has wings, north and south (Asa Sul and Asa Norte), and a central axis (the Eixo Central). It was inaugurated in 1960s as the airplane city both in its design and in its relationship to other urban centers. Brasília high on the central plains, was too far from Rio, São Paulo or Salvador for easy rail or highway travel. In the 1960s, its bureaucrats typically traveled by plane from the new city back to their former homes on the Atlantic Coast on weekends. Perhaps with greater resonance, the sleek sinuous curves of Oscar Niemeyer’s iconic government buildings in Brasília evoked both aerodynamic design and the cool sensuality of bossa nova. The swooping curves and soaring ramps of Niemeyer buildings like the Brasília Cathedral and the Palácio do Planalto made concrete the midcentury modern triangle of the jet age: airplanes, Brasília and bossa nova style. But if this connection captured the spirit of a moment, it was a fleeting moment. Brasília became one of Brazil’s musical capitals, but it became more celebrated for rock, forró and instrumental music than for bossa nova. Air travel continued to figure as a theme in bossa nova, through examples like the Juca Chaves song mentioned above, as well as Marcos Valle’s brilliant “Jet Samba”. Fans of Brazil’s grittier genres occasionally criticize bossa nova for being too cool, removed, polished. 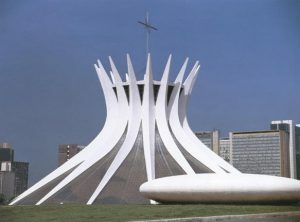 (Exactly the same criticisms are made of Niemeyer’s architecture.) These are fair observations. 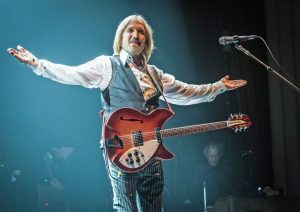 But rather than being seen as weaknesses, these should be seen as achievements, as defining characteristics linked to the origins of the music. They are reflections in the shimmering reflecting pools (known as water-mirrors in the Brazilian parlance) of mid-century modernist Brazil. 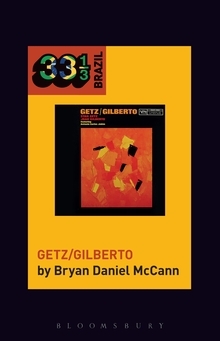 João Gilberto and Stan Getz’s Getz/Gilberto by Bryan McCann publishes tomorrow and will be part of our holiday sale!